This tutorial provides you with a foundation for working with Adobe InDesign styles. It is the first lesson in the Adobe InDesign CS6 Digital Classroom book. For more Adobe InDesign training options, visit AGI’s InDesign classes. Earlier in this lesson, you formatted text by applying a paragraph style. You can use styles to easily and consistently format paragraphs, individual words or letters, as well as entire text frames and tables. Here you will apply styles to both paragraphs and individual characters. 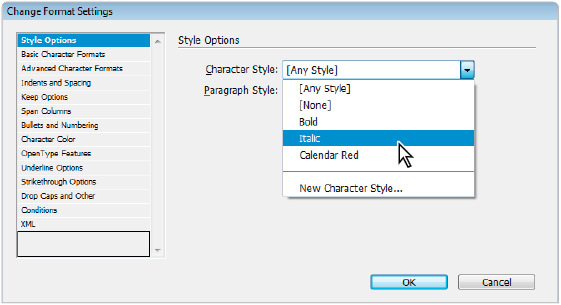 Format the text using the Calendar Event style from the Paragraph Styles panel. Notice that the Calendar Event style applies several attributes to the events in a single click, styling the date bold, the name red, and the web address in italic. 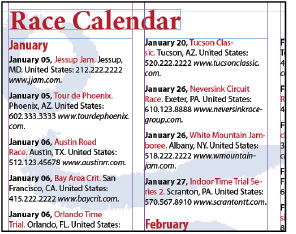 The Calendar Event style includes several styles that are grouped together into what InDesign refers to as a nested style. A nested style applies several formatting attributes to text within a paragraph in a sequence you can define. 1 Double-click on page 2 in the Pages panel to display page 2 within the workspace. When using the Type tool, double-clicking on a word selects the word, triple-clicking selects the line, and quadruple-clicking (that’s four clicks!) selects the paragraph. 1 Using the Type tool ( ), right-click (Windows) or Control+click (Mac OS) anywhere within the text frame on page 2 of the document. Choose Find/Change from the contextual menu that appears—it’s near the top of the many choices available in the Contextual menu. The Find/Change window opens. Be careful to not select the Specify Attributes to Find button, which is an identical button located above the Specify Attributes to Change button. 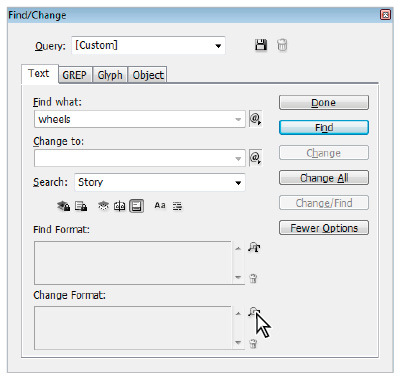 Click the Specify attributes to change button to modify text attributes in specific words or phrases. 5 Click the Change All button. A window appears indicating that five instances of wheels have been found and formatted using the style attributes you specified. Press OK, then Press Done to close the Find/Change dialog box. InDesign notifies you of replacements it makes using the Find/Change option. 1 In the Pages panel, double-click page 1. Once the page is displayed, you may need to decrease the magnification to see the full page depending upon the size of your monitor and screen resolution. If you can’t see the full page, change the display magnification by choosing a smaller percentage from the Zoom level drop-down menu located to the right of the Help menu in the Application bar. 2 If you can’t see the text frame located to the right side of the page in the pasteboard area, choose the Hand tool ( ) from the Tools panel, then click and drag from the right to the left until this text frame is visible. 3 Select the Type tool ( ) from the Tools panel, and then click to insert the cursor inside the text frame on the pasteboard. Next you will import some type that was created using a word processor such as Microsoft Word. 4 Choose File > Place to import a text file into this frame. In the Place dialog box, navigate to the Links folder within the id01lessons folder and select the file Sidebar.txt. Confirm that Show Import Options is not selected, and then press Open. 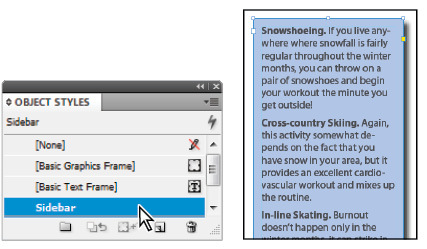 You can use Object styles to apply background colors, effects, and multiple text styles to a frame in a single click. This makes applying formatting, and keeping your document design consistent as easy as a single click.